Are you planning your stay in Bastia on the island of Corsica and want to explore the island independently with a rental car? Therefore you are looking for a serious and reliable car rental service where you can rent a car. With a rental car you are able to explore the island of Corsica independently. Our portal helps you in exactly this situation: With our car rental comparison we make sure that you can orientate yourself to this and thus select a service that fully meets your expectations. Regardless of which criteria are particularly important to you: With our comparison you are guaranteed to find the right rental car for your stay in Bastia! The tranquil port city in the north of the French island of Corsica is an extremely popular holiday destination, both for the French and for international tourists, who particularly appreciate the architecture of Bastia, as well as the numerous fantastic sandy beaches, the excellent cuisine and the many sights offered in Bastia. 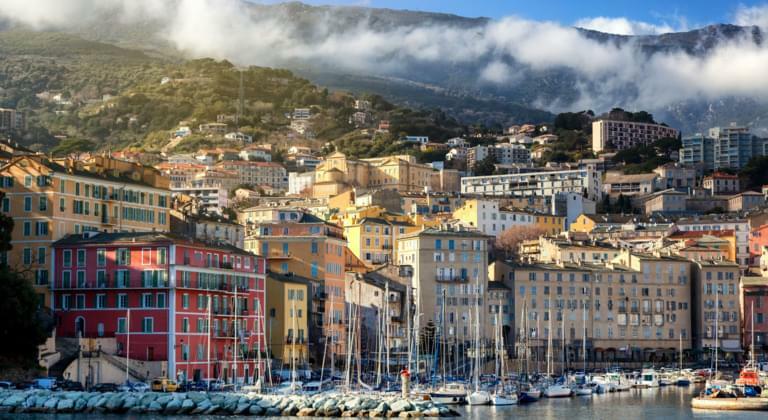 Bastia is also a great starting point from which to explore the whole of Corsica, which is of course particularly comfortable and easy with a rental car and offers you numerous possibilities to discover the extraordinary nature and culture of Corsica in an individual way. Admire the wonderful vineyards and orchards of the region and make a trip to Bonifacio. The city of Bonifacio is the southernmost city in France, which awaits you with its medieval old town and a mighty citadel. You can relax on one of the numerous dream beaches of the island - with a rental car you have numerous possibilities to arrange your stay in Bastia individually. When you arrive at Bastia-Poretta airport south of Bastia, you can pick up your rental car, which you have selected in advance using the comparison on our portal, directly from the rental service, after which you have numerous options to explore Bastia and Corsica in general, according to your personal wishes and interests. For example, whether you drive directly to Bastia, about 20 kilometres to the north and check into your accommodation or take a trip or a voyage of discovery into the surrounding region first, a rental car is completely up to you. Regardless of which rental car you ultimately choose: Our portal allows you to compare the different aspects of different services and then select a vehicle that suits you and will accompany you throughout your stay in Bastia. Experience the extraordinary beauty of Bastia and the surrounding region and explore Corsica, as well as Bastia itself, with a rental car according to your ideas. Our portal will help you to find the right service so that you can enjoy your holiday in Bastia in a relaxed and carefree way. If you would like to spend more time in the region, a trip with the rental car to Olbia on the island of Sardinia is also recommended.